Personal usage: Order below and take advantage of WSV3's competitive pricing. Ladies and gentlemen, the world's finest PC weather tracking software. 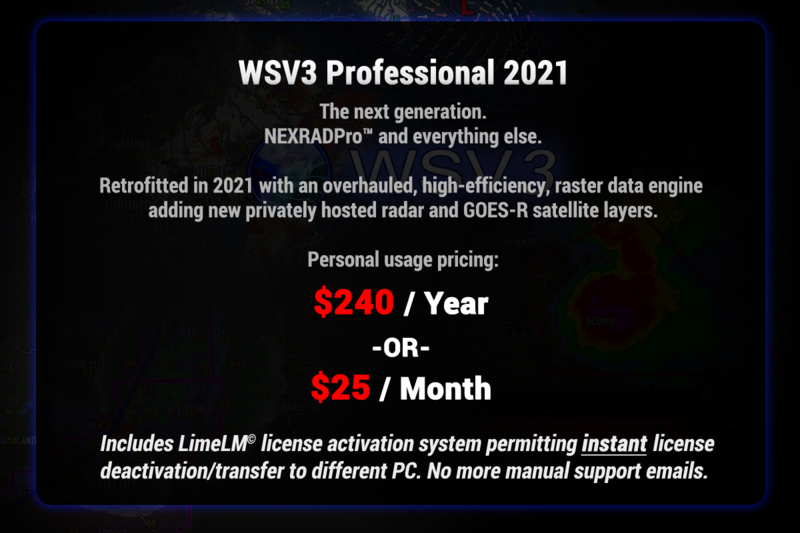 WSV3 Professional was released on December 13th, 2015, marking the start of its long-intended career as the highest-value, most-competitive piece of live PC weather tracking software available to consumers and industries alike. All potential clients are welcomed to download a 14-day fully functional no-obligation free trial copy of the product here. Users are encouraged to join the WSV3 User Forums and contribute valuable feedback about the software. We depend on your feedback. We are militantly committed to improving the software in free, continuous updates, driven by nothing other than crucial user feedback and our own ideas for innovation. If you have an issue or bug report with the software, shoot us an email and we will work it out. May 2018 V4.0 Update: WSV3 Professional is now available only through a 1-year subscription (monthy subscription coming soon). According to user feedback, we have implemented a brand-new licensing system which enables automated license transfer to different PCs without the need to contact us. As such there are no more volume discounts for multiple licenses, since multiple PCs now translates to simultaneous usage given the new automated transfer-in-seconds feature activated in the products "Menu->Licensing->Deactivate" option. See Download page for upgrade instructions from V3.7. Never hesitate to shoot us an email (contact@paulmarv.com) if you have a specific question.